Congratulations to Malachy the Pekingese that won the Westminster Dog Show. I think he would approve of Vinosh’s portrait of a Pekingese. 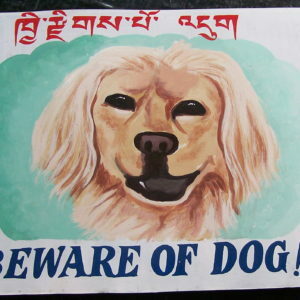 This hand painted portrait of a Pekingese dog was painted by Vinosh. 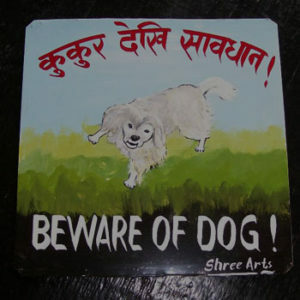 Vinosh left Nepal shortly after this painting was done to work in Saudi Arabia, where he can make a better living doing manual labor than hand painting signboards in Nepal. 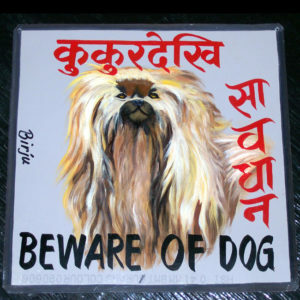 This beware of Pekingese sign is currently available at Nomad in Boston. Please contact them at (617) 497-6677, and they will be happy to assist you with your purchases. Their website is NomadCambridge.com. 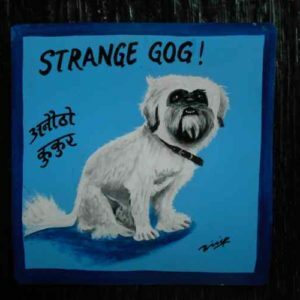 Chop Suey the Shih Tzu and Pekingese mix is a strange dog indeed in this hand painted portrait on metal.